The reason why I play soccer is to have fun. I get to spend time with the friends that I have made and play the sport that I love. It keeps me busy and keeps me in shape so I can play longer and push myself to become better at what I do. I play soccer because I feel that it helps me grow as a person. I’ve met so many new people and friends throughout the years I’ve been playing soccer, and I’ve learned so much about cooperation and teamwork and what it means to be a good friend. I don’t know what I’d do without my girls and my coaches. They’re some of the most important people in my life. I’ve learned how to cooperate with my coaches and other adults, not to mention the fact that I have a passion for soccer and I’m dedicated to becoming the best I can be. It’s a fun sport and I hope to come as far as I can, and meet many more people along the way. I play soccer because it is fun and brings me joy. Every time I play, I love it even more. I enjoy learning new skills and displaying them on the field. I have played soccer since I was 4, and I can’t imagine not stepping out on the field. Soccer is not only fun, but it provides many opportunities to build lifelong relationships. It allows you to work as a team, but also showcase your abilities. I hope to continue to grow and play soccer for as long as I can. I play soccer because one, I love to play it and two, it’s one of my favorite sports. I stated playing soccer when I was about 5 years old, and I played on a lot of different team for a lot of different reasons, mostly had to do with the coaches being bad or moving. When I broke my foot, I wasn’t able to play for 6 months, which made me miss it and love it even more. When I healed, my old team had departed so I tried out for WSA. I was afraid I wasn’t going to make it because I had been out for so long, but I did, and I was so exited! It was harder at first because I was still hurting still and I didn’t know anyone, but now I love the team I’m on, coach’s and teammates. I hope I will be able to play soccer in the future. When I first started playing soccer, I didn’t know how important it would be to me. Soccer is my second home and my teammates and coaches are my second family. I feel safe when I play soccer and I feel like I cannot be judged. It gives me a challenge every time I step onto the field and it helps me learn how to reach my goals. I have learned to put 110% of myself into everything I do, academically and in sports. Soccer has taught me to strive for excellence. I play soccer because it is my passion and the only place where I can truly be myself. 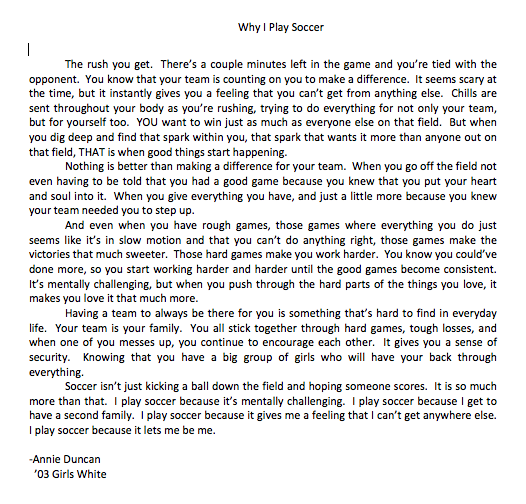 The reason I play soccer is because I’m passionate about it. There’s nothing more exciting to me then going to practice or a game. After a bad day, it feels really nice to go out to practice and forget about it all. During games my mind is clear of everything else in the world besides my coaches, my teammates, the goal, and the ball. Soccer is not an easy sport but when you really love something your always striving to get better and better. My team is one of the best parts about soccer. We are all very close and talk all the time. We goof around a lot but when it’s time to get to work we get it done. I’m so blessed to have a group of girls and coaches that push me to be the best I can be! Soccer is without a doubt my favorite sport! I play soccer because it helps me stay active and it is fun. I enjoy it because you get to compete against other teams and I am a competitive person. I also like that I play a team sport like soccer because we have to rely on each other to help fix our mistakes on the field. The reason I play soccer is because I love the feeling when I touch a soccer ball. I feel like no one can stop me or get to me. I feel safe. I play soccer because I love it and in the plus side it gets me in shape. Ever since I was three years old I have had the ball at my feet. There is so much joy in the sport, the feeling of being cheered on and the joy of your team scoring. I love having a feel of joy for something that is not only fun but also competitive, I love the bonds I get to make with my teammates and coaches. Soccer isn’t just something I do for fun though, Soccer is how I live, if I am stressed I go play soccer. If I am mad I go play soccer. If anything is wrong soccer picks me up it pushes all the bad things to the side for just a moment to where I can just forget about all my problems and be happy. Soccer is not only my life but my passion and hopefully my future. That is why I play soccer.